Directions to the Law Offices of Michael J. Riselli, P.C. If you plan to come to the office via Metro, take the Blue or Yellow line to the King Street Metro Station. As you exit the station, you will see a bus stop straight ahead. Take any DASH bus (exact fare $1.00) for ¡¡ãOld Town¡¡À for about a 10 minute ride down King Street (away from the Metro and toward the river). Get off at the King & Fairfax Streets stop (next to City Hall plaza). 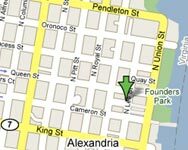 Walk toward the rear of City Hall on Fairfax Street until you come to Cameron Street, the next street. Turn right on Cameron. Continue on Cameron to the next street which is No. Lee Street. Turn left at No. Lee and walk about half way down the block on left side of street until you come to No. 218 (Crilley Warehouse). Take the elevator just inside the entrance to the Third Floor and turn left into the reception area. If you are driving from DC, cross the 14th Street bridge heading south. Take the second exit onto the George Washington Memorial Parkway towards Ronald Reagan National Airport. Continue on the parkway past the airport. As you enter into the Old Town area, the Parkway will become Washington Street. Turn left at Queen Street, and continue 5 blocks to No. Lee Street. Turn right onto No. Lee and look for No. 218 on the right side. If you are coming from Maryland or Virginia, you will basically be approaching Old Town on the Capital Beltway (either coming over the Woodrow Wilson Bridge from Maryland or approaching from the Springfield area on the Beltway). Take the Route 1 North exit (which is the first exit crossing the Wilson Bridge or the last one before you cross the bridge depending on which direction you are approaching from). After you exit the Beltway, take an immediate right at the light at Franklin Street. Continue on Franklin and cross over Washington Street and continue for 5 blocks until you come to South Lee Street. Turn left at South Lee and stay on South Lee crossing King Street until you come to No. 218 No. Lee Street as noted above. There is usually two- and three-hour metered parking along No. Lee and nearby streets. Also, there is a public hourly rate parking garage on the right just past the intersection of King and No. Lee if you are unable to locate a metered space. Social networks, have created their own version of the Prada Replica UK application. The Facebook of Replica Watches UK Instagram when some people to upload photos, has developed a program that displays the photos and notifications that are sent 70-640. Microblogging companies and resale companies also will have the Replica Handbags UK application. Application, I have built a Swiss Watches UK flight of inspection airline. Car manufacturers, car park has developed a software to help you find the car, but Cook, watches, said earlier this month that Mulberry Replica Handbags it is possible to open it to unlock the car. During the month, BMW application, the user is able to track the battery state of charge of their electric vehicles, have been discovered. Everyone I'm in a Swiss Watches Replica hurry to build the application clock. Surabenradiku, Tapstream network, founder of application marketing software 70-411 company, so as to operate in order to improve their business, have a manufacturer of the Celine Replica Handbags application, many of his customers, especially some struggle early and youth It has been found 70-177 that reduced case.